This dramatic floral print bag, hand-waxed with a custom beeswax blend, is tough enough to take a beating. 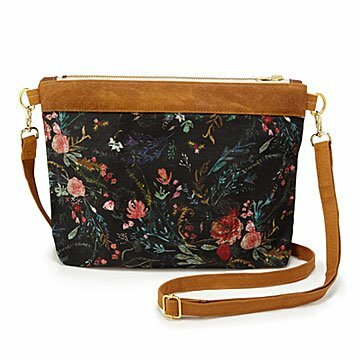 While you're admiring the dramatic botanical print that graces this crossbody bag, consider a practical note from makers Leah and Cody Seelye: "Our bags can withstand a beating." Handmade from waxed cotton canvas, they're tough and water and stain resistant—not to mention beautiful. Leah and Cody prepare their own canvas using a beeswax blend they custom formulated. Great for holding small essentials when shopping or out for the evening, the zippered pouch features a waxed canvas wrist strap with lobster clasp. Handmade in Michigan. 12" L x 10" W x 10" Deep, Strap: 48" Adjustable by 11"
Clean with damp cloth and dry soap flakes. In extreme situations, may machine wash in cold water and re-coat with a wax bar. My sister needed a purse that she wouldn't "loose" things in. This was just what she wanted that was pretty and stylish.